Wild Animal Attacks: Does the Premises Owner Have Liability? As a plaintiff’s personal injury trial lawyer who handles premises safety cases on a regular basis, I have been reading with interest an article about a wrongful death lawsuit recently filed in Illinois against a condominium owner regarding the death of a resident killed by black swans on the property. The dead man actually cared for the black swans for the condo and the condo kept them on the property to keep away geese and limit geese droppings on the grounds. You may recall this incident when it first happened, as it was on national news, certainly made news here in Atlanta, and was a shocking event with a rather bizarre manner of death. On the morning of April 14, 2012, one of the swans attacked the man, Anthony Hensley, causing his kayak to topple, according to witnesses at the time. The bird continued to lunge at him as he struggled to make it to shore before he disappeared under water, authorities said after the attack. He was pronounced dead at a hospital after dive crews scoured the 50-foot-deep pond to find him, authorities added. The lawsuit claims that the defendants “knew or should have known that mute swans are strongly territorial with a dangerous propensity to attack.” Amy Hensley’s attorney, Kenneth Apicella, pointed to Illinois’ Animal Control Act, which says that the owner of an animal that attacks a person in certain circumstances can be held liable for damages. This case will be an interesting one to follow, but it begs the question: would such a case here in Georgia “fly” (sorry for the pun). My answer is probably not. The Georgia Supreme Court in 2012 decided a very similar case that involved the death of a woman by alligator. The case, The Landings Club v. Williams, 291 Ga. 397, 728 S.E.2d 577 (Ga. 2012) was watched with great interest in the Georgia legal community, as it could have meant enormous liability for landowners in Georgia, which our law have heavily favored since Oglethorpe first founded our beautiful state. In The Landings case, a woman who was visiting her family at a planned residential/golf club community that had several lagoons on the property, which was on Skidaway Island off the Georgia coast. No person had ever been attacked until the night of October 5, 2007, when Williams, who was 83 at the time, went for a walk near one of the lagoons near her daughter’s home some time after 6:00 p.m. The following morning, Williams’ body was found floating in the lagoon. Williams’ right foot and both forearms had been bitten off. 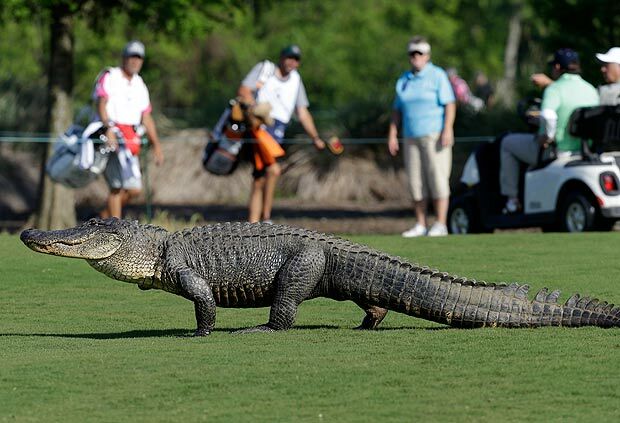 Later, an eight-foot alligator was caught in the same lagoon, and, after the alligator was killed, parts of Williams’ body were found in its stomach. No question this was a gruesome death; but was The Landings Club responsible? The majority of the Georgia Supreme Court said no and largely blamed the death on the decedent herself for walking outside at night when she knew or should have known there were likely alligators living in the lagoons. The Landings Club won the case on Summary Judgment, meaning there never was even a jury trial in the case. “Based on the facts presented at the time of summary judgment in this case, reasonable minds could differ as to the essential elements of appellees’ premises liability claim. Indeed, there are very specific questions in this case that must go to a jury: whether decedent knew that large and aggressive alligators were living on the premises and in the lagoon in which her body was discovered; 2 and whether appellants exercised reasonable care in inspecting and keeping the premises safe from alligators—in particular, alligators that were over seven feet long and alligators that were aggressive toward humans and pets as per appellants’ removal policy. Rather than allowing this evidence to be reviewed by a fact-finder, the majority opinion bars appellees’ premises liability claim simply because the decedent once observed an alligator standing on the roadside. Such a result disregards all the other factual circumstances in the case and is not in keeping with our jurisprudence. (“all the circumstances at the time and place of the incident” must be considered). Accordingly, I would affirm the judgment of the Court of Appeals and allow the premises liability claim to be tried before a jury.” Benham, J., dissenting. So, the Chicago Black Swan case made me think of the Georgia Alligator Case, which made me conclude that, under Georgia law, at least, the Black Swan case wouldn’t have a flying chance. But, Illinois Law will apply in the Black Swan case, so we will just have to stay tuned for now. Will be interesting to follow.